In defense of airline food: Airplane cuisine is a triumph of cooking, science, and logistics. It’s the question that nobody ever truly wants to answer, the kind of query known to strike fear into the hearts of free men and women, to twist stomachs into knots, and make those willing to brave the not-so-friendly skies wish they had a parachute. But as the rest of the world collectively wrenches at the thought of another mystery meal at 36,000 feet, I have a confession to make: I love airplane food. That’s right. The plastic tray of overcooked veggies, insipid sauces, and industrial condiments: I crave it. I love the summer sausage and soft, spreadable cheese packets. I love the cold, stone-hard bread, even more when dipped into the plastic tug of hydrogenated oil. I love dumping an entire packet of black pepper over my chicken, which is invariably drowning in a viscous brown sauce of unknown provenance. When the smell from the galley fills the main cabin and the wheels of the service carts start spinning, I shake with anticipation. I don’t normally admit this. When one of those typical conversations comes up—the ones that start with “and what’s the deal with airline food?”—I shake my head in feigned disgust, offer up some prepackaged dismissal of the genre, and hope the moment passes before my true feelings surface. That’s because we are trained from our first moments of flying to not like airplane food, to mistrust those little trays filled with indistinguishable piles of starch, protein, and plant matter. And, on an objective level, there are plenty of faults to find with the starched salads and dubious cuts of meat served in economy class. It wasn’t always this way. Meals were once the highlight of air travel. A 1958 Pan Am commercial shows an exuberant couple being fed from a cart containing great hunks of roast beef and holiday ham as the announcer tells us that “delicious food adds to the enjoyment. It’s is prepared in four simultaneously-operating galleys where dishes can be cooked in five-minute ovens.” Back then, federal government strictly regulated airfare prices, so the only way to compete for customers was by offering superior service. That meant rolling meat carts and briny seafood trays and free packs of cigarettes for dessert (really). What nostalgists who talk about the golden age of flying forget, though, is that air travel back then was a privilege reserved for the rich. According to the Bureau of Transportation Statistics, a round-trip flight from New York to Los Angeles in 1958 cost $1,580 by today’s dollar. (Four times what it costs today). But all of that changed in 1978, when Congress finally deregulated air travel pricing. The fare wars soon followed, as airlines looked to cut costs elsewhere to make up for the lower ticket prices. Gone were the days of martini carts and caviar service. Though slashing luxury food items may have been the most conspicuous change, the cut that rocked the industry and inspired a new era of corporate penny-pinching came from American Airlines’ chief Bob Crandall, who in 1987 calculated that removing a single olive from onboard salads would save the company $40,000. In the decades since Crandall’s olive, industry number crunchers have busied themselves with extrapolating the savings found for removing everything from beverage garnishes ($50,000, as United discovered) to salad strawberries ($210,000, for Delta) to those little bags of crushed pretzels ($2.5 million for Continental). As the realities of sluggish post-9/11 air travel mounted, American carriers dropped domestic meal service altogether, with Continental serving up the industry’s last free economy class meal in October of 2010. Buy-on-board meals are now the standard on domestic flights, turning what was once a major expense into a profit center for airlines, says William McGee, author of the 2012 book Attention All Passengers. 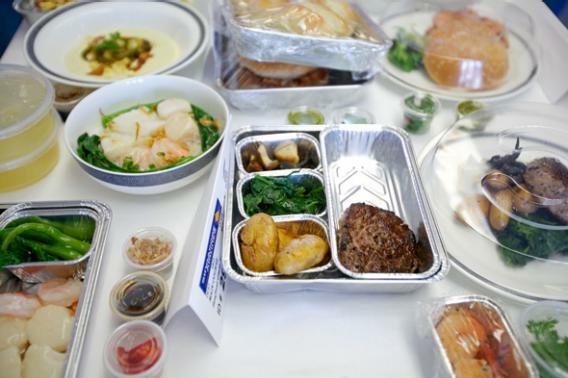 But meals on international flights remain a fundamental part of the aviation equation, with the world’s biggest carriers showing a renewed interest to combat the negative perception and confront the myriad challenges that come with serving food at 36,000 feet. Let me be clear: I’ve only eaten a handful of meals in my life on an airplane that would satisfy me back on Earth, but when it comes to eating, context is everything. When you take into account all that goes into an airplane meal, all of the immense logistical, financial, and scientific challenges conspiring to make food vanish altogether from the skies, it’s astounding we’re served anything at all. 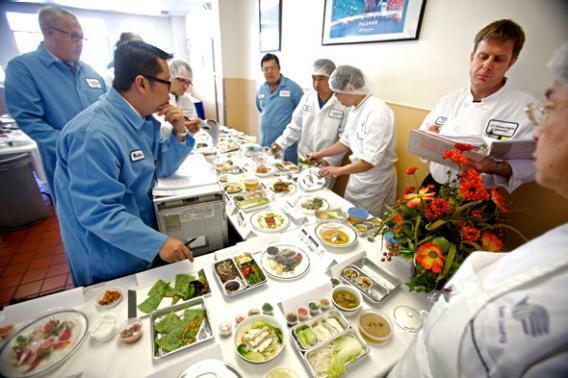 Those challenges came into focus recently in San Francisco as a few dozen members of Singapore Airlines’ catering staff gathered for two days to test out the fall menu lineup for a chunk of its North American-based routes. Dressed in a mix of chefs’ coats and lab coats, armed with thick binders and clipboards, the group tasted and tweaked their way through nearly 200 first, business, and economy class dishes, taking notes, dispensing criticisms, and logistical concerns, then adjusting until the dishes addressed the laundry list of requirements it takes to make it to your seatback tray. On the ground, they all looked like winners: lobster dumplings with steamed bok choi and a heady seafood broth; rows of gently steamed, artfully assembled dim sum; composed salads with autumn fruit and rosy curls of Spanish Iberico ham. “That micro basil is an elegant touch,” whispered one chef to another. But up in the air, the challenges of serving hot, visually-appealing, texturally-diverse meals pile up quickly. Does the chicken stuffed with dried apricots look right in that serving vessel? Can that appetizing garnish fit into the 2-inch space in the plane’s convection oven? Is it too expensive to pay a cook to cut those cherry tomatoes in half so they don’t roll around during flight? For an airline serving more than 50,000 meals each day out of their Singapore hub alone, the tiny details matter. All of this is to say nothing of the most important challenge of all: taste. As the jokes have accumulated over the years, airlines have worked to change the perception of in-flight cuisine. Singapore spent $1 million to build a kitchen that simulates the low-pressure environment found at cruising altitude, a work zone where chefs can conduct more accurate taste tests. Delta turned over the corporate kitchen to big-name chefs like Michelle Bernstein and Michael Chiarello to up their culinary game. And some airlines have even commissioned outside research to help better understand the challenges they face feeding people five miles up in the sky. In 2010, Lufthansa worked with the Fraunhofer Institute for Building Physics IBP to answer a variety of questions concerning inflight dining, among them, why passengers were ordering tomato juice onboard at an exaggerated clip. Fraunhofer’s scientists found that perceptions of saltiness and sweetness drop by as much as 30 percent onboard, due largely to the fact that our odor receptors (taste being largely a function of smell) are compromised in the bone-dry environment of an airplane cabin. This might make the salty-sweet punch of tomato juice more attractive to people who wouldn’t touch the stuff on the ground, but the impact on more subtle foods like seafood, chicken, and pasta can be devastating. Cost-cutting pencil heads, palate-crushing cabin pressure, flavor-distracting engines: When you take all of these factors into account, the fact that we are served even mediocre meals constitutes a minor miracle in kitchen science. It’s not despite these challenges that I love airline food, but because of them. When it comes to the little pleasures of life, environment, and circumstance are everything, which is why a cold can of Heineken and a Jennifer Aniston–Hugh Grant flick go down so easy at high altitudes—not because the beer is better or the movie is less saccharine, but because these tiny touches of real life distract us from the bizarre truth that we’re zipping across the sky in the belly of a metal bird. If we extend that generosity of judgment to average beers and lame romantic comedies, why don’t we do the same for that semi-mysterious entree? But my affinity for airline cuisine is not merely an appreciation of the dark arts it takes to create it. Over the years of nonstop air travel, I’ve developed a few strategies that help me avoid the types of disappointment infrequent flyers experience when they plunge head first into an inflight meal. First, always opt for the sauciest entrée: braises, stews, and curries get better over time, whereas pieces of lightly-dressed protein are almost uniformly dry and bland. (Be sure to choose tomato-based sauces over cream-based ones, which taste tame and one-dimensional at high altitude.) Make immediate use of those salt and pepper packets; though airline caterers salt their food more heavily, they still err on the side of restraint. And if you drink wine, make sure it’s the most powerful grape on hand. Subtleties are lost above the clouds. As a general preemptive measure, fly Asian airlines as often as possible. “The coach service in Asian and Middle Eastern airlines is comparable to the business-class service you get from American carriers,” says William McGee. The Singapore girls will soak you in fruity Singapore Slings, All Nippon offers respectable soba and Japanese-style fried chicken to their coach passengers, and Korean Airlines boasts their own farm, which provides the building blocks for their legendary bibimbap. And one last thing: Regardless of where you’re flying and whom you’re flying with, always take the chicken over the pasta. All that heating and reheating leaves the pile of noodles limp and lifeless, which is inexcusable at any altitude.